It’s finally hot up in here. Well, maybe I’m just telling myself that in order to justify eating 3 of these last Monday. I can tell you right now that this post is going to get me in trouble. 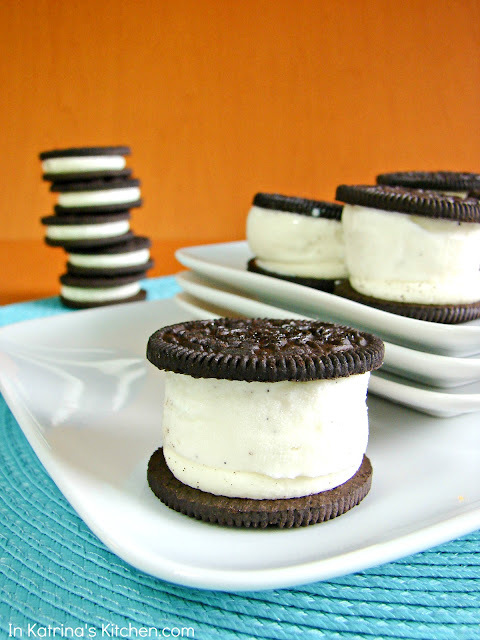 My husband is a man who likes his Oreos and his ice cream…and well, he didn’t get any of these. In fact he doesn’t even know that I made them. Shh! They are gone now, so let’s just keep this between us, okay? To be fair I bought the package of cookies and told him to save me some. He saved me 4 Oreos. Four. What can you even do with four Oreos? Maybe you can use them as currency in your cookie daydream world. I’m pretty sure I ate one and my kids went super secret stealth ninja on me and consumed the other three while I was making their very healthy lunches. I bought another pack and hid them in the freezer. GENIUS! I keep vegetables in there, and raw meat, and things that require actual food prep. No way the Mr. was looking in there. One evening while my husband was at work my parents and brothers stopped by for dinner and this little gem of an idea came to me as I was grabbing the turkey burgers out of the freezer. I used Double Stuf Oreos (duh) because I still think that we all need to agree to stop purchasing the original ones. I will write the directions out for these ice cream sandwiches because I will get emails if I don’t, but you can figure this out, right? Have fun with them and treat yourself to one this afternoon! PS: Does it bother anyone else that “Double Stuf” is only spelled with one f? PSSS: I know this isn’t rocket science. I promise that my next recipe with have measurements, mixing, stirring, and all that jazz. Happy eating! Let your ice cream warm up for 10 minutes on your countertop. Twist open the Oreos. Spoon a small scoop of ice cream onto each cookie and reattach the tops. Place in the freezer at least 1 hour until firm. These are perfect for little hands. My toddler loved having a whole dessert to himself. Placing the sandwiches back in the freezer for an hour or more keeps the ice cream from oozing out as you take a bite, but feel free to scoop and enjoy right away too. Oreos and ice cream sound amazing together! My "cookies & cream" Skinny Cow ice cream sandwich seems really pathetic now. How did you know Cookies & Cream is my absolute favorite. I don't blame you for eating 3. These are HUGELY awesome! Yeah why do they even sell the regular "stuf" Oreo's? Does anyone really buy those? These look amazing Katrina! Oreos are by far my favorite. I haven't had one in so long but after seeing these I may need to pick up a package. These are a great idea! Woah! These look heavenly! I love anything oreo but this is just incredible! I definitely need one of these!…or three. Oh wow, That's easy idea but so creative. ohhh… these are PERFECT!! lol I love that you kept these from your husband ha ha ha ha … sneaky, I like it 😉 Quick question, how did you get the ice cream to look so perfect? …. talk about GREAT presentation!! Thanks! I just ran a spoon around the edges while the ice cream was pretty soft still. Not necessary but you're right, it did make them look a bit more tidy. LOL on hiding the oreos in the freezer! Good plan. And great sandies! Love how small these are, you get to eat more that way right? Super cute idea! Genius!!! They look wonderful! And you are so right about Double Stuf! Way better! These are CRAZY easy! Yep, I can do it. Mine will just be dipped in chocolate and then frozen. Oh yeah. That's the way to do it. LOOK at all of that ice cream. I love it when I have more filling than cookie and more icing than cake! My recent post chocolate covered pretzel cookies. Oh my gosh, such a cute idea! My kids would love these! Is this the perfect ice cream? I think for me it is! Looks delicious and gorgeous, love the presentation! Trying not to look, trying not to look (because then I'll want to make them and eat every single one). These are such a fun dessert for summertime. Very cute. My husband and daughter would both love these! These look amazing!! 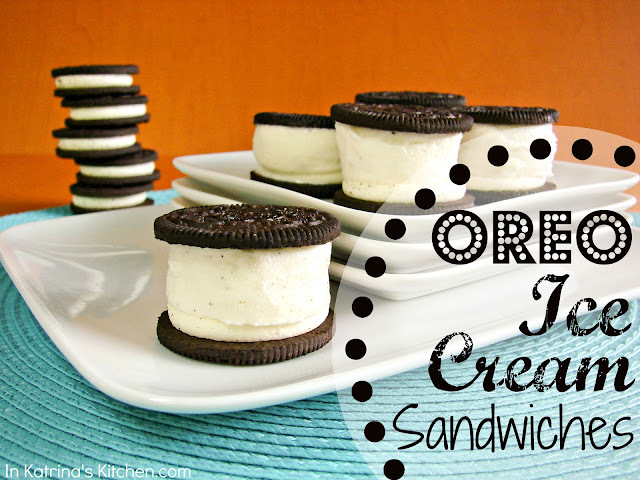 I'd have to hide these from my Oreo-holic family if I want any for myself! Fantastic idea! Simple and delicious, what could be better? These would be incredibly unsafe in my home. Wowzers!!!! I love it! Will the cookies be too hard? worried that the ice cream will squish out on the sides.